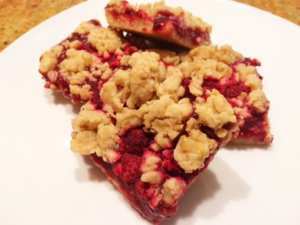 Raspberry Bars at The Captain’s Manor Inn are a guest favorite. This past week we had a guests request the recipe so she could make them at home. To serve 15 people, we start with 2 boxes of Krusteaz Raspberry bars and doctor them up a bit to put our own spin on them. To make the bars more substantial we use the shortbread crust from both boxes for the bottom crust, and make our own crumble topping to finish it off. In addition to raspberry filling provided, we add fresh or frozen raspberries to really bring out the raspberry flavors. To make these raspberry bars at home follow the directions below! Bake for 26-28 minutes until the crumble is golden and the raspberry filling is bubbling on the sides. Enjoy heated up or at room temperature !